A custom home is all about location, location, location. But once you’ve picked a spot, where do you go from there? After deciding to build a custom home in Las Vegas, make sure you take the right steps, so your dream quickly turns into a reality. While there are plenty of custom homes in Las Vegas for sale, why not build something all your own? When you build your dream home, you let your imagination take over. Once you’ve jotted down all your dream custom features and collected photos for reference, you’ll want to start organizing it all. Decide on a budget. Once you know how much money you’re working with, you can start meeting with architects and contractors. Together, you’ll talk through your ideas and start figuring out what’s realistic. Select the right people. A custom home takes a lot of teamwork. Pick people you can communicate with and who understands your vision. Once you’ve found someone you click with, you’ll want to tour their homes and check references. Make some solid decisions. All the ideas you had before are a good starting point, but by the time you’ve hired an architect and a contractor, you’ll need to have narrowed down what you need, what you want, and what you can afford. More detailed plans in the beginning will cut out change later on (which can be expensive and time-consuming). Set a timeline. Contractors will set up a bed and let you know how quickly they can get the work done. If you haven’t already, you can get your old house on the market and start packing up. Keep communicating. Don’t be afraid to call your contractor to make sure things are going as planned. You can even drop by to check on things, it’s your home after all! Building a home in Las Vegas can be a smooth road as long as you’re organized. If you still haven’t decided on a location, we recommend you choose Life at the Top. In MacDonald Highlands, a luxury home community, you have the unique opportunity to either build or choose your new dream home. The choices to customize are yours. Build what suits your exact needs and lifestyle. While each home has a distinct style, their designs complement the neighborhood as a whole with sleek modernity. The average home consists of 4-6 bedrooms and 7-8 bathrooms. Square footage of these luxury homes ranges from 5,000 to over 8,000 square feet. Common characteristics of the homes are a clean and modern style, pools, and sweeping views of the valley that can’t be beat. Tucked into the mountainside, MacDonald Highlands elevations reach 2,700 feet. The neighborhood is located in Henderson, only a 25-minute drive to Downtown Las Vegas or 15 minutes to McCarran Airport. 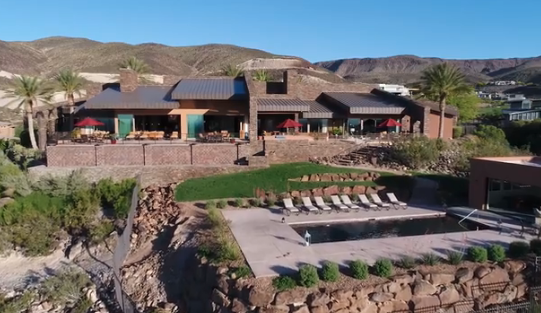 If the outdoors are more your style than the bustling city, Red Rock Canyon is a 30-minute drive to hiking and biking, or Lake Mead Recreation Area is a great place to take out the boat for fishing or water skiing. If you want recreational fun closer to home, DragonRidge Country Club is right within the gates of the neighborhood, featuring a stunning golf course and a state of the art fitness center. Luxury homes at MacDonald Highlands is called “Life at the Top.” Your neighbors will be esteemed and successful politicians, athletes, and artists. Residents have the choice of several successful schools to choose from for their children within the Clark County School District. MacDonald Highlands is the best and most luxurious in the greater Las Vegas area. If you are ready to build or buy your dream home, a luxury community in MacDonald Highlands is the place to do so. Contact the office of Kristen Routh-Silberman at 702-614-9100 to start your journey to the top.